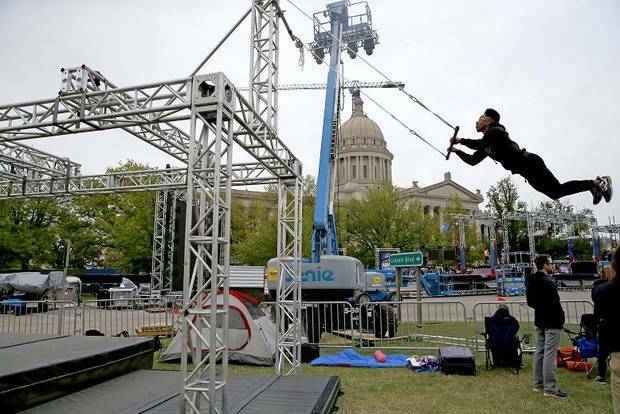 UPDATED 1:15 p.m. Sunday, April 14: Due to heavy rains, Saturday night's "American Ninja Warrior" filming has been delayed to tonight. 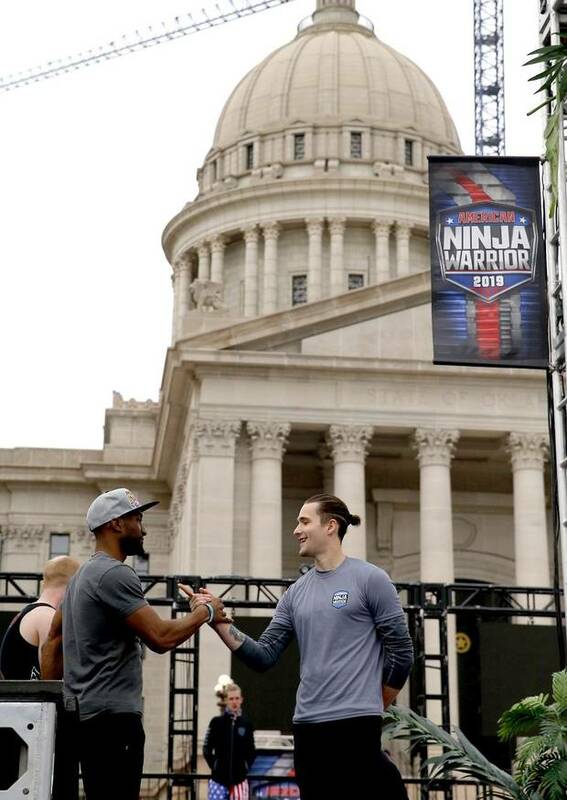 To request tickets, go to on-camera-audiences.com/shows/American_Ninja_Warrior. 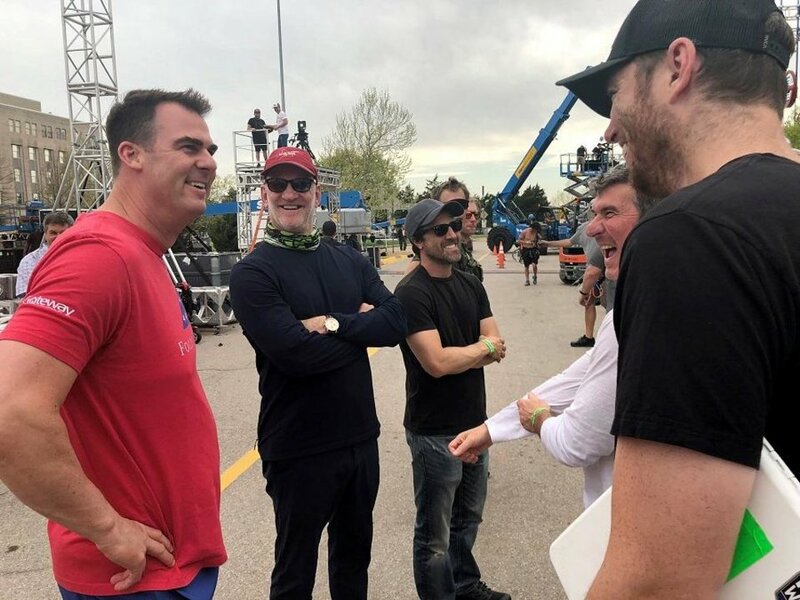 “In this one, for example, when they’re hanging upside down, they’re hanging about 18 feet over a 4-foot pool of water, which is entirely safe, but fairly intimidating,” said executive producer Anthony Storm Friday evening just hours before filming was to begin. He confirmed that Oklahoma Gov. 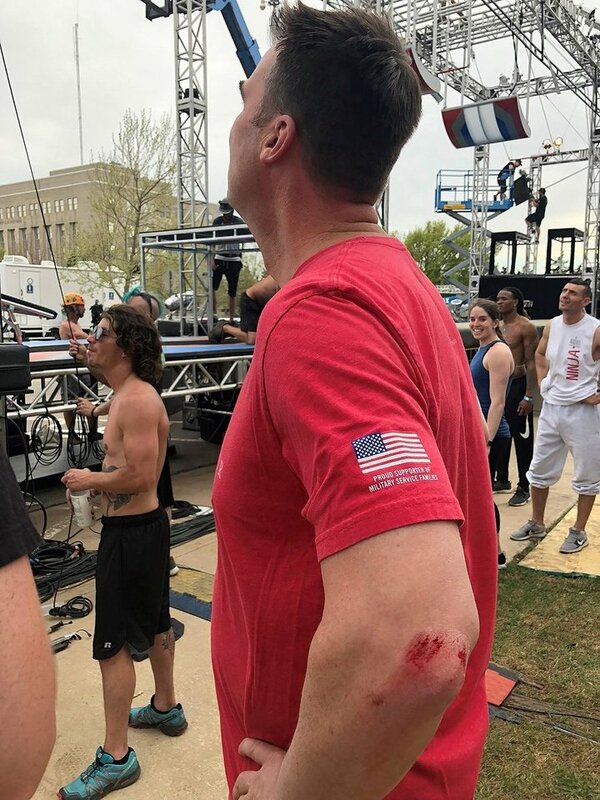 Kevin Stitt’s Wednesday run at the course, which resulted in a bloodied elbow for the former CEO, is believed to be the first time a governor has attempted an “American Ninja Warrior” course. The producer said the “traveling circus aspect” is part of the appeal of “American Ninja Warrior,” which is filming for its 11th season overall and eighth to air on NBC. 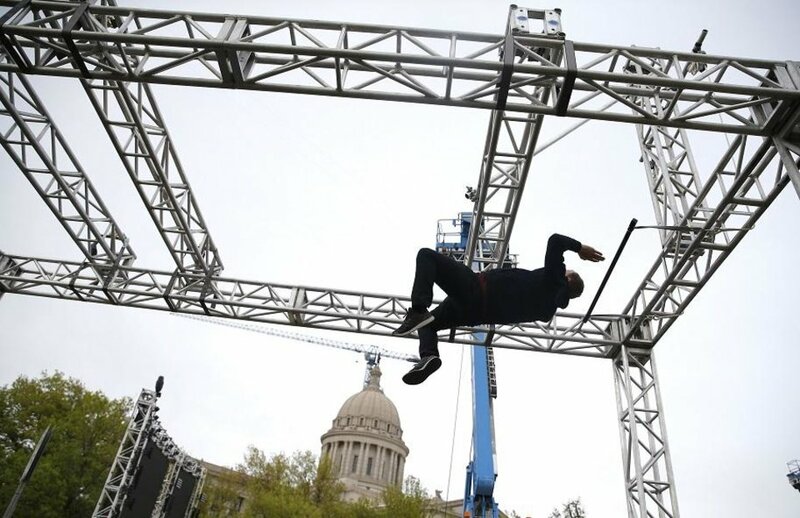 The show follows competitors as they traverse challenging obstacle courses in qualifying and finals rounds in various cities around the country. 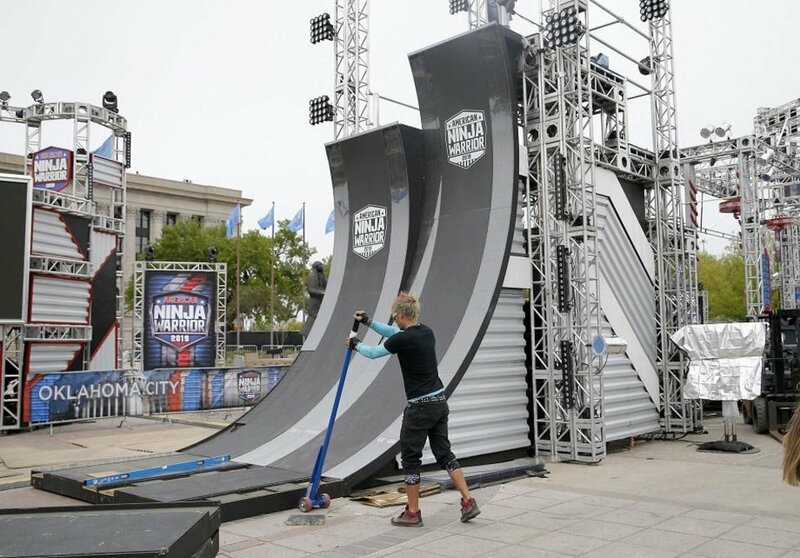 Top competitors in each of the city finals rounds move on to the national finals, where they compete on a four-stage course that includes multiple obstacles on each stage. The winner, who must complete all four stages, will earn the grand prize of $1 million. It's the production’s second visit to the state Capitol, where it previously filmed in 2016. “A lot of it has to do with scale. Our course, as you can see, is large, so it requires a backdrop that gives it the proper scale. If we put this in the parking lot, all you see is the course, and you don’t get any context of the size of it,” Storm said. Each of the 10 obstacles in this year’s OKC course towers about 20 feet tall. It takes about 10 days to set up, film on and break down the course. “The show means so much to so many people across the country. And we’ve always said that it’s a platform for everyday people to do extraordinary things. And everyday people live in every part of this country, so if we don’t visit every region of this country, then we’re going to miss some of those really special people. The show’s second OKC stop in such short order speaks volumes about the people in our state, said Tava Maloy Sofsky, director of the Oklahoma Film + Music Office. “An estimated 50-plus local crew are being employed, and over 200 out-of-state crew members are occupying an estimated 2,200 hotel room nights in Oklahoma City in only 10 days, which boasts an economic impact worth bragging about,” she said. On Thursday, the production visited several additional OKC landmarks to shoot footage and capture the excitement of the show’s local fans. Rodeo Cinema Executive Director Kim Haywood encountered the crew filming in Stockyards City. The “American Ninja Warrior” crew and competitors can relate to hard work. 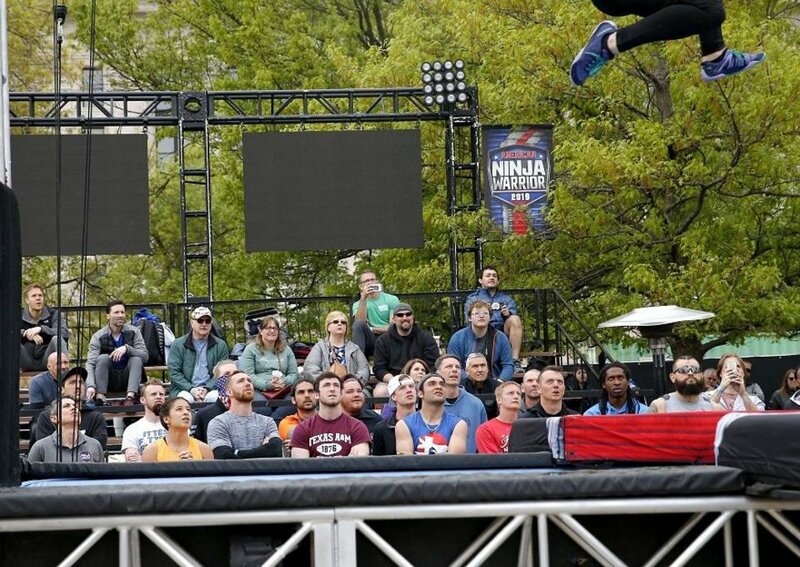 Since it airs at night, that’s when the show films, and 100 contenders were to take on the obstacle course Friday night, with the top 30 or 35 to continue in the competition Saturday. 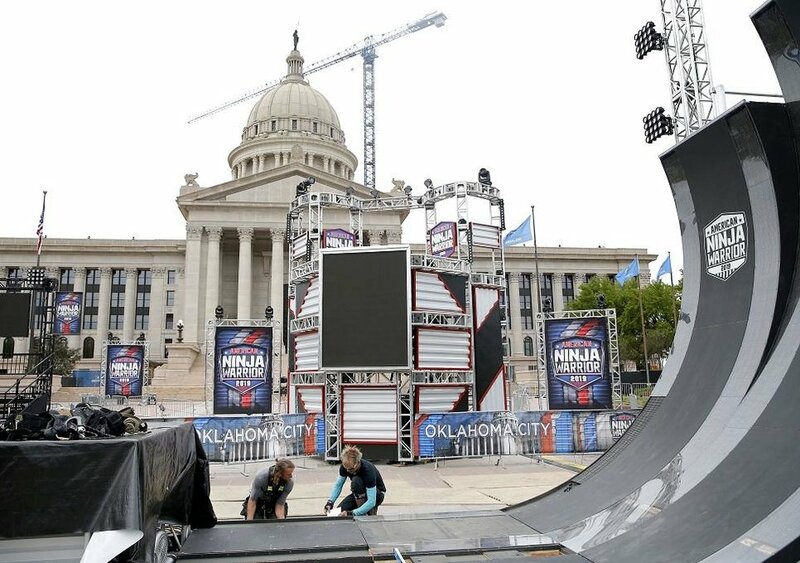 “American Ninja Warrior,” which will include episodes filmed in Oklahoma City, will launch its eighth season on NBC with its summer premiere at 7 p.m. Wednesday, May 29. 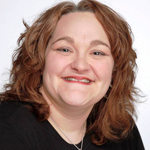 The show then will move to its regular time slot from 7 to 9 p.m. Monday, June 10. Filming began in March with the Los Angeles and Atlanta city qualifying rounds, before coming to Oklahoma City, with filming continuing in Baltimore, Seattle/Tacoma, Cincinnati and finally, Las Vegas for the show’s national finals.